Pleasure in Drifting Change. It's Always Better to Enjoy Life, Right? No Walls between Performer and Audience, they Create the Space Together. Ainu Pride? No, Simply Living her Life. That's All. It's Always Better to Enjoy Life, Right? She took her family from their home in the capital back to her hometown at Akanko Ainu Kotan after the Tohoku Earthquake and Tsunami. "I thought we should kind of withdraw back home for a while. Back then, it was like, I couldn't figure out how to get everything going, though. Then Fukiko said, 'Oh, just stay home for now!' She really loves the area, and she's determined to live out her life here. She's always thinking about the neighborhood." Emi says this is the opposite of her own nature. "She asked me stuff like, 'Well, what do you want to do, Emi? and then we'd start going back and forth and round and round. I guess it was like, there were things I was going to say myself but then she would say it first, and it hit hard, like a spear. 'Ouch! Right in the heart!' sometimes. “I know it's good to take responsibility and make up your mind yourself, but I just can't seem to do it. Stuff happens, and sometimes things change. Ague is a lot like Fukki [Fukiko, her sister]. Serious, and stubborn too. It's like we're night and day, really. Maybe this totally unlikely meeting is some kind of training in life for me." 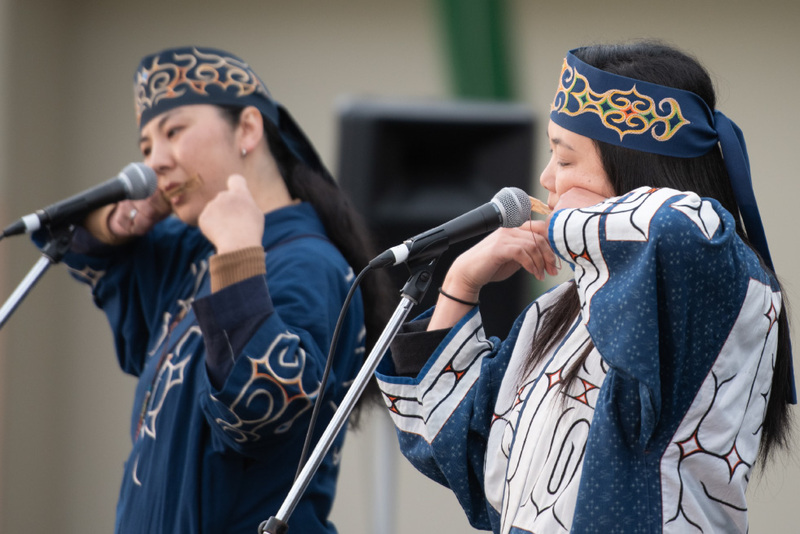 Emi and Fukiko now tour as performers of Ainu Upopo (folk music) under the names Kapiw and Apappo. The names are Ainu words. Kapiw means "seagull," and Apappo means "flower." 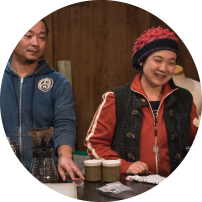 They appeared in the 2016 documentary Kapiw and Apappo - A Tale of Ainu Sisters-. "That movie just showed how messed up our everyday lives are! That (director) Sato filmed all this stuff you shouldn't go showing people! "There aren't many people left with that kind of sense of humor. Everyone's so serious now. Their heads are all hard as rock. They all say these brilliant things, but if they aren't careful their heads are going to burst. You shouldn't look down on that kind of atmosphere, either. It's fun to sit and listen to the older people of the Kotan talk. " 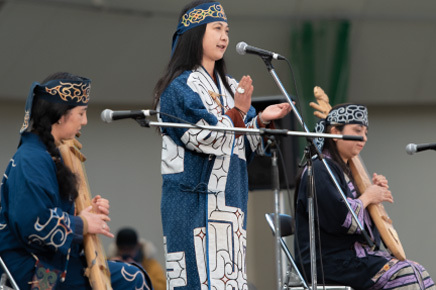 At the Akanko Ainu Kotan, the two sisters are considered everyone's adorable Emi and Fukki. Before he and Emi were married, Ague used to drive her up to Akan on his motorcycle. When they would walk the streets, people would come up and say "Oh, hey, you're Emi's whatchamacallit. You know I used to change her diapers!" and all he could do was grin and bear it. The people of the Kotan likely adore Emi because of her love of laughter, and her easygoing nature. 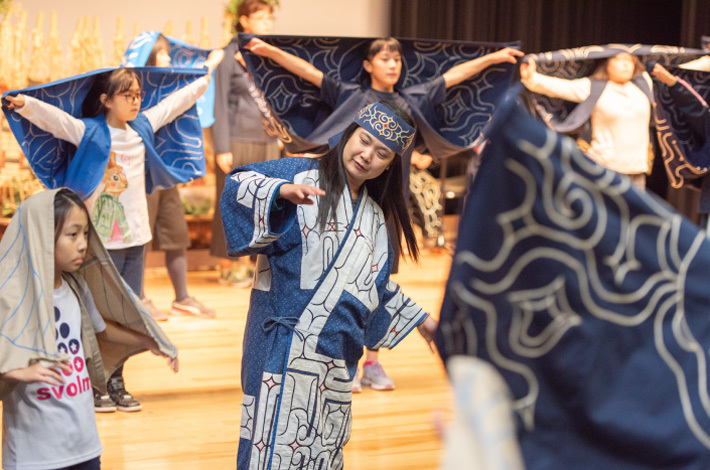 Their activities with the Foundation for Ainu Culture include teaching dance to the children of the Kotan and going out to perform dances in various places. However, these performances aren't divided between those dancing and playing music, and those watching. The experience is a shared one. "People think there's either good dancing or bad, but there's always something more. You can watch and think it looks cool, or find a feeling of stability. 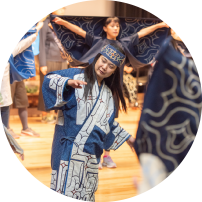 Dance can offer a message, or create an atmosphere, and those are also ways of understanding. And there's no 'These are dancers. These are watchers,' we all feel part of it. " Emi is part of a wide range of activities as part of Kapiw & Apappo and with the Foundation, but in everyday life she's busy taking care of her home and children. 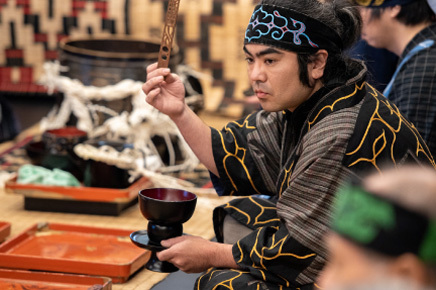 Even while she's busy helping to pass on Ainu culture, keeping a home and raising her children, she's also doing her own creative work. 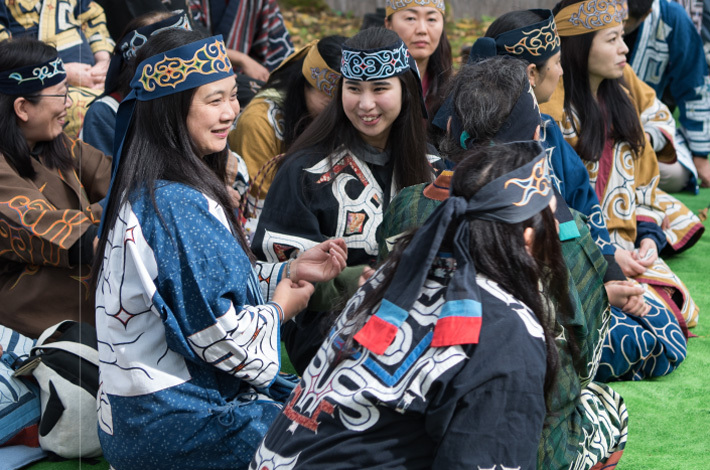 In the Ainu language, the work of creating thread from the bark of Japanese elm is called kaeka. Making thread from bark requires drying the boiled bark then spinning the shredded fibers into thread. Weaving traditional cloth all starts with this necessary work. "Ah, kaeka. It's got such a smooth flow to it, you can do it almost unconsciously. It's such pleasant work to do. It's work that makes me feel truly happy. It's like I'm totally immersed in that world. When I come back to this reality, I've got to do all this other stuff and it takes me forever to return to normal. “When you're busy doing this or that, you can't really keep everything in balance. Making things is 'Mu' [nothingness]. It's kind of dull, but I like being in that state. I find it so soothing." 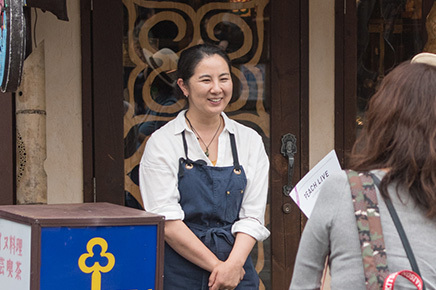 She says her grandmother in Urakawa taught her the handwork. 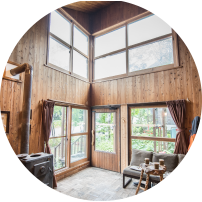 The materials she uses now include bark from the elm tree in that grandmother's yard, as well. "Grandma's thread is mixed in here too, maybe. It was really rough and of hard to work with. The way this stuff is made, you know, if you go to the Kotan and walk around, there'll be people in front of the shops embroidering or carving wood, and you can just ask them about it. My mom tried to teach me, but she said, ‘You'll just give it up anyway,' and brushed me off. So, grandma taught me. " She's also working on t-shirt designs and more, in addition to weaving. She used to take her notes out and sketch at the diamond when she was watching her son's baseball games. "I used to sketch during games, and spin thread in the car. Games are so long! I felt like I was wasting time otherwise. The other moms would come tell me 'Hey, he's up next!' and I'd go watch and cheer him on for a bit. Stuff like that. " 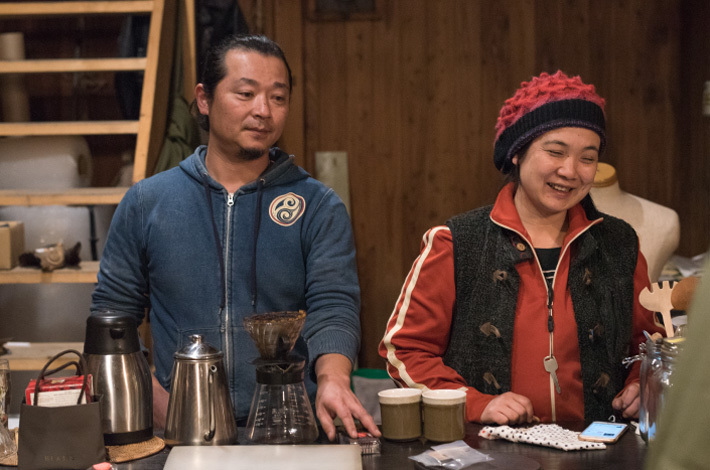 Even as she lives near nature, she still garners media attention and does interviews about her work with Ainu culture, but she feels something is off. 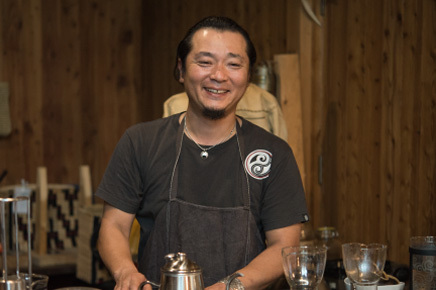 "I sometimes want to ask things like 'Are you trying to get me to talk about my Ainu pride? Is that the line you want?' But that's just so formulaic. I'm not going to be all like 'My heart is so full of pride!' so just quit already! It sounds so fake, it's too embarrassing. “Even when people call me a craftsperson, I feel like I'm nowhere near good enough yet. I just want to hide in the corner making thread, and anytime the spotlight hits me I just want to die!" She has no reason to put her pride in her people into words. She simply enjoys dancing, and singing, and crafting. For her, it's natural, and has perhaps the same roots as her talk about the lack of difference between dancers and the audience. Whether or not you share that sense of pride when you pick up one of her works depends entirely on you, perhaps.